(Newser) – You'll soon be able to crack open and swig down a can of… Scotch whisky? 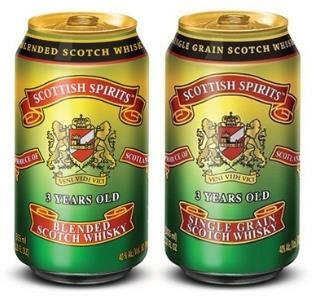 Liquor company Scottish Spirits Imports plans to introduce aluminum cans filled with Scotch to the US by February 1. Each can will contain 12 ounces of the 80-proof liquor, or about eight shots' worth, reports the Huffington Post. The retail price: $5 a can. This stuff probably tastes like paint thinner. I mean, how good can 3year old Scotch be? It looks like a way to get rid of some sort of leftover crap, and make a buck from it. Congress needs to stop this.